Now I am ensconced in southern California, on the coast, where it is temperate and, for the most part, calm, and I have missed the experience of historic cold in the Midwest and other parts of the country brought on by something called a polar vortex. I imagine I might have frozen solid in my little cabin up north, but it is also hard to imagine—despite all my years of winters—the feel of bitter cold when all around the sun is shining, the birds are singing, ripe lemons and limes and oranges are falling off trees, and the bougainvillea is rosy pink. Mounds of rosemary hum with honeybees, and poinsettia grows tall, outside, its petals bright green and red against adobe walls. Then there are these funky flowers that flew here from Paradise. And the cross-country trip taken to get to this place fades. The trip is done, or so it seems, so on with the next, and it feels like an effort to recall the sights and feelings of driving from upper Michigan to the Pacific coast, to recall the crusty roads of snow and ice and dirty salt that led Elliott and me across the western U.P. and the northern watery edge of Wisconsin into Duluth, Minnesota, where we turned south, heading straight for bright sunshine. 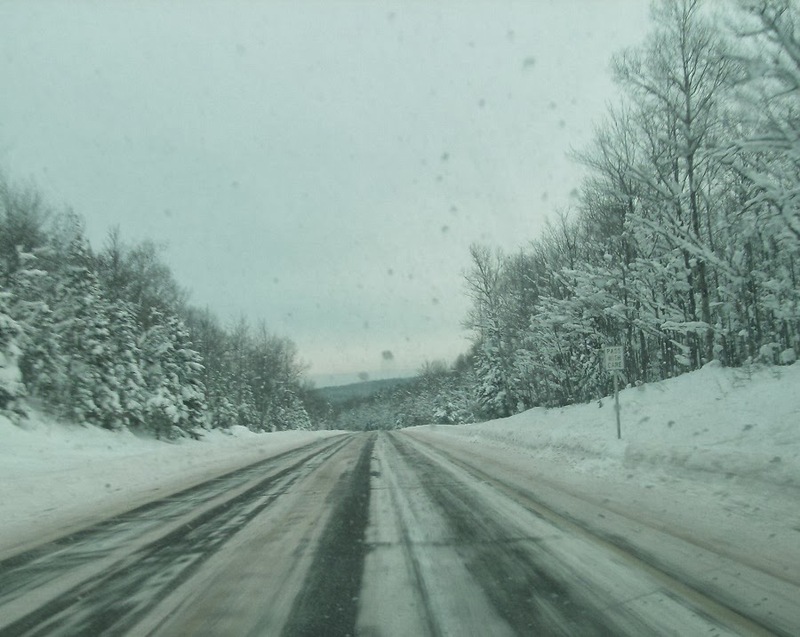 That was a warm day, in the 30s, maybe even the 40s, and the roads became wet with melting snow, and it felt good to be driving, to be heading through and into new territory. As we headed out, the day we left, way back in 2013. Elliott and I quickly fell into a routine, and he proved to be a fine traveling companion. His main job was to investigate thoroughly each motel room upon arrival. His nose showed me which spots on the carpet had the most experience (of what sort, I don’t know), and his creeping and leaping exposed every nook and cranny and hiding place in the room. He always sought out the highest spot and sat there for a while like an eagle surveying for prey. I shuttled him in and out of the rooms in his carrier, and once free in the van he sought out the space below my knees, on the floor, huddling as close to the seat as possible (he couldn’t quite fit under it). Escaping the van did not seem to enter his mind, and although he showed interest in whatever was beyond the motel room door, he never attempted that dash into nowheresville. 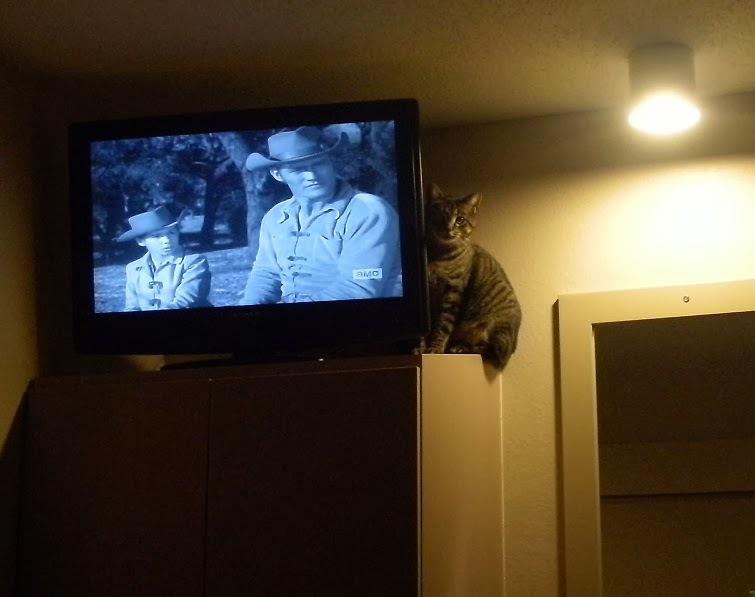 In Faribault, Minnesota, Elliott got up high with The Rifleman. Every morning we hit the road before dawn, and as the sun rose on the second day we found ourselves in Iowa. I had planned to stop in Mason City and Nora Springs for reasons of family history, but that did not pan out. Instead, we flew past windmills with Casey Kasem’s Top 40 from 1975 on the radio. A feeling of Americana swept over me. Here we go! An All-American Road Trip! I experienced this feeling most every morning—an excitement, an exhilaration, a sense of freedom and over-arching purposefulness. By most afternoons, that feeling would wane. 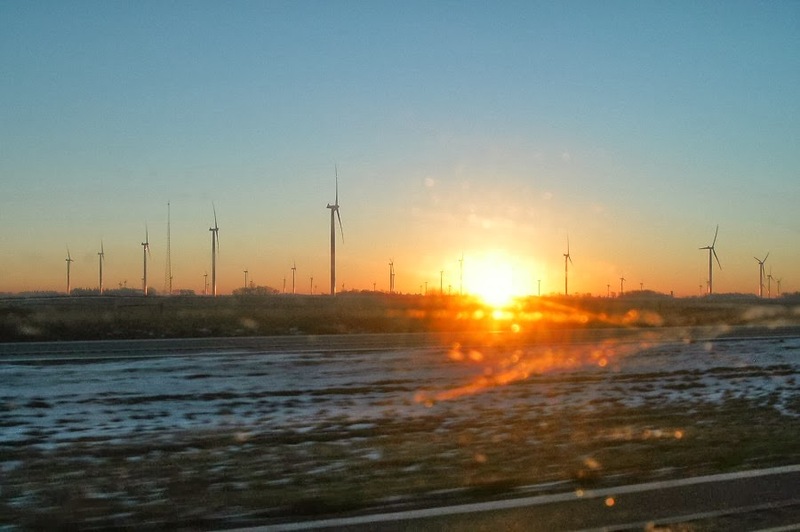 Windmills at dawn in Iowa. After Iowa, Missouri, where I pulled off at a rest stop, which was also a welcome center, just about the nicest I’ve ever seen. Inside there was a great mosaic collage depicting Missouri history. 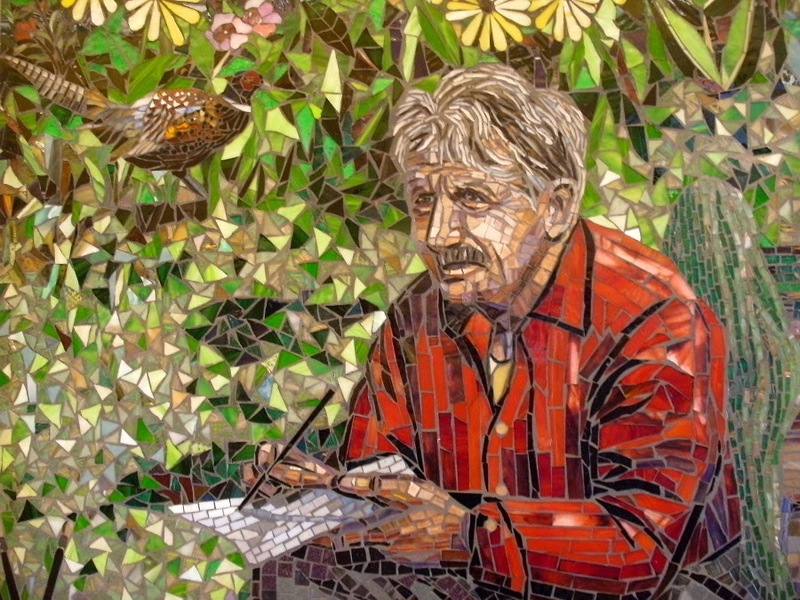 Thomas Hart Benton, one small part of the Missouri mosaic. We spent that night in Ottawa, Kansas, and shortly after dawn the next day we passed a sign in Emporia: Last Free Exit. Before I could fully ponder the implications of that, we were on the Kansas Turnpike. I had no idea how much it would cost to exit the turnpike or when I would even get the chance. Last Free Exit. Maybe one should one take it? Just because it’s free? The turnpike was a marvelously smooth road surrounded by gentle, treeless hills rolling smoothly off to the horizon. A sign told me we were in the Flint Hills of Kansas and the next sign cautioned me not to drive into dense smoke. Now, why would I drive into dense smoke? And, wait, was this a ploy? Some kind of Kansas money-maker? No more free exits, dense smoke up ahead, better get off here, but, guess what, it’ll cost you twenty bucks … There was no exit, no smoke up ahead, no demand for money, just an overcast sky and rolling hills and plenty of time to think about it all. The Flint Hills of Kansas in December. Crossing into Kansas the day before I had reached back among my CDs, pulled out, by happenstance, “The Wizard of Oz,” and it was still in the CD player. Oh, if I only had a brain … As I tootled through the Flint Hills, I tried to think of a musical for every state, coming up with only the obvious, “Oklahoma!” and “The Best Little Whorehouse in Texas.” But of course there is also “Chicago” (for Illinois) and “The Music Man” (for Iowa). Does “New York, New York” count? There is a barrenness about the Flints Hills of Kansas in December. 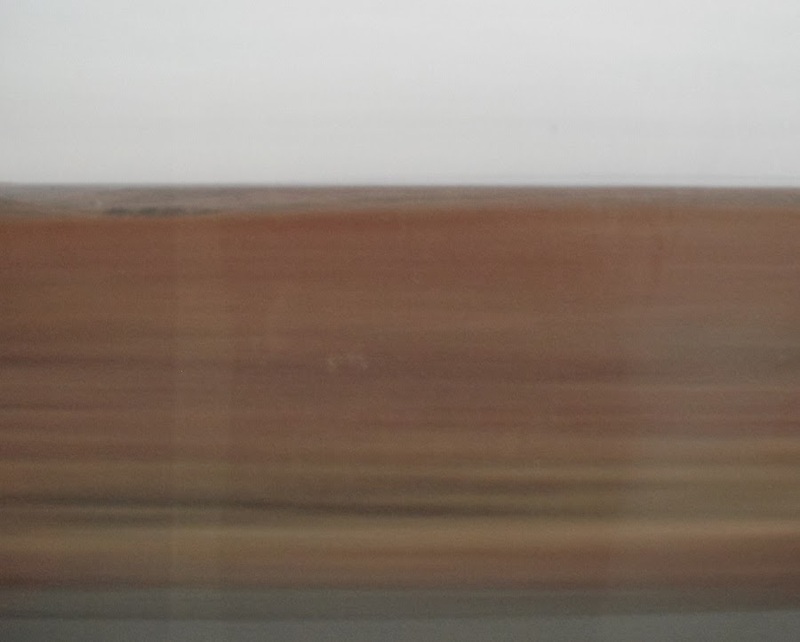 The road is grey, the prairie brown with flat amber highlights. An outcropping here and there, as if something were just under the crust of the earth, pushing it up, taking a peek, hey—what’s out there? It became beautiful and calming, but then, after 20 or 30 miles of it, I began to wonder if there were ever going to be an exit, free or otherwise. I was beginning to feel in need of an exit. There was an off-ramp for cattle pens at Cattle Bazaar Road, but that wasn’t quite what I had in mind. A little buttery yellow began to show up in them thar hills. The whole thing became a mirage, a stack of golden brown pancakes topped with a pat of melting butter drizzled with maple syrup. A little crisp bacon on the side. At long last a service area, tucked between lanes. I had guessed it was windy, but not until I got out of the van did I realize how windy—50 or 60 m.p.h. does not seem an exaggeration—and how gosh darn cold it was. We gassed up (et cetera) quickly, and hurried on our way. I began thinking about the middle of nowhere. Take a trip across this country and you begin to realize that the middle of nowhere is just about everywhere—everywhere, that is, but where I live, in Michigan’s Upper Peninsula. There you may be on the edge of nowhere, but you are certainly nowhere near the middle of nowhere. The middle is here, in the thick of the country, all around you. When the turnpike ended, it cost me five or six dollars to stay on the same road, Interstate 35, to head into Oklahoma. In Oklahoma City we hooked up with Interstate 40 and headed west. In Steinbeck’s “Travels with Charley,” he talks about a journey taking on its own character, becoming its own entity as it happens, as it unfolds, and I suppose that’s true. I thought about that before I left, and I also, somewhat incongruously it seems now, tried to think of a name for my vehicle, the dark blue 2004 Dodge Caravan with its back seats removed and its rust all along the front lip of the hood; the mighty steed with more than 120,000 miles under its belts that I was counting on to ferry Elliott and me across northern plains and prairies and desert and hills and the cloverleafs and forks and turns of a few unknown cities and towns. Steinbeck named his truck Rocinante, in reference to Don Quixote, and in “Blue Highways” William Least Heat Moon traveled in Ghost Dancing, a truck named for Least Heat Moon’s Native American heritage and his circumstances at the time. But I could think of nothing to call the van except The Van With No Name. One cannot go out to discover America, it seems to me, or anything else. One can only go out to discover. A few seconds along Ventura Highway, in California. This week, my mother celebrated her ninety-fourth birthday with her three daughters, lunch, a bit of chocolate, a slide show of some old family photos, and a lot of love. How lucky I was to be there. Now that you mention it, I think I do remember a little amusement park. On the north side of the road? A piece of roller coaster running along right next to the road? Reminded me of a little place near where I grew up -- the Wild Mouse was a favorite ride! Glad you got some snow! And Elliott has impressed me a bit on this trip, too. I had no idea he would handle it all so well. I love the bird of paradise background, photo of Elliott surveying his temporary domain, and Van with No Name(but a bit of rust). You truly made the best of a long trip. And at some point I have to do it all again, in reverse! "... a little cold and snow. ... " Sounds to me like you have mastered the art of understatement. I love traveling with you, Elliot and the Van with No Name! And we love having you along! I hope you have an awesome time with your family and have a safe trip home! p.s. 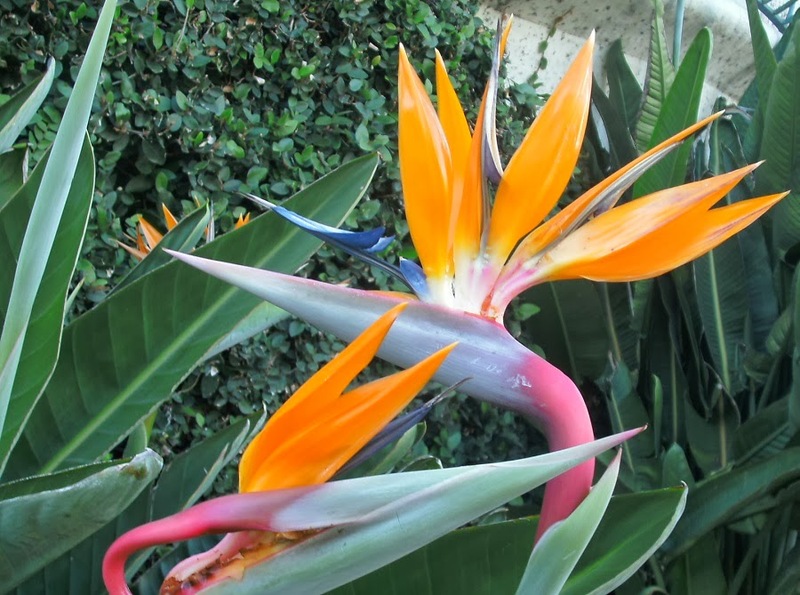 I have a few Bird of Paradise's in my yard, but none have blooms. That one you photographed is gorgeous! I appreciate the warmth, but there are moments when it just feels way too hot, too sunny, and too dry. I love the smell of salt air, though. And the flowers. Good luck with those grandkids! Faribault Minnesota - my Mother's hometown. Didn't anyone else knew where it was! But looks like Elliot likes it.